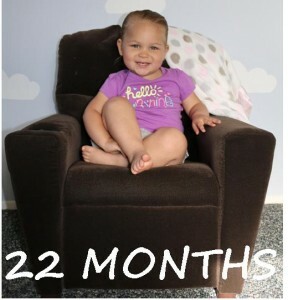 Your little life has been flashing before our very eyes–case in point, I completely forgot to take your 21 month photo, oops! It’s hard to believe that there are only two more of these “Dear Sirena” monthly posts/photos left. I’m sure the letters will keep coming but not on the same schedule and not accompanying the chair photos any more (which I guess is a good thing because it’s starting to take bribes [gummy bears] to get you to sit on your bottom on the chair long enough to snap a photo!). You have really blossomed these past two months into more of a social butterfly–even though it still takes you a while to warm up to new people or to a crowd, once you do warm up there is no stopping you! You wave and say “hi” to just about everyone you see, you will sing or tell stories on command, and you LOVE LOVE LOVE to dance no matter who’s looking. Last month your Uncle Thomas married your new Aunt Ashley on the royal Queen Mary ship and that’s where we really saw you start to change–you warmed up really quickly to some out-of-town family you’d never met before, Aunt Quincie and Uncle Mo, even giving hugs and blowing kisses to them, and you partied the night away, shakin’ your stuff to the music and making your presence known on and off the dance floor. On the academic front, you’ve made some pretty big strides lately. For quite a while when I would ask you to count you would only say “one,” then that morphed into skipping “one” and only saying “two, three,” and just last week you skipped “one, two, three,” and went straight into “four, five, six!” You also named one of your baby dolls “Nine” so it seems you are very fond of numbers. Colors are also coming along just fine. For a while everything was “boo” (blue) and lately everything has magically changed to “burple” (purple). Sometimes you’re spot on with orange or yellow or green but most times if I ask you what color something is, it’s either “boo” or “burple.” You also recognize letters/words and you’ll point to something (like a license plate) and say “E.” It’s so amazing to witness your little brain at work! Lately when people ask me how old you are I’ve been telling them, “She’s just shy of 2.” It’s really, really hard to believe that in less than two months you’ll be a big 2 year old! But you seem ready for it–just this morning I said something about you being my baby and you said, “No.” I asked you, “Oh, are you a big kid then?” and you replied, “Aye” (yes). No matter how big of a big kid you become, you will always and forever be my baby. This entry was posted in Dear Sirena..., Sirena, Sirena's Monthly Photos.